The Solent Cruising and Racing Association (SCRA) have recently published a list of over 150 Solent Area / Race marks for 2016. There are a number of changes to the list for 2016 including a new mark, two additional navigation marks, as well as a number of position changes and name changes to existing marks - A full list of the Solent Mark destinations and their changes is available for download over on the SCRA website. Sail racers with Raymarine onboard can now take full advantage of our LightHouse II Release 14 (or higher) Advanced Sailing Tools, by importing these race mark positions as waypoints directly into your Multifunction Display. We’ve provided a GPX file for download which has been modified for Raymarine MFD’s and GPS systems. This GPX file lets skippers import the racing marks ahead of time and allows you to quickly and accurately define the race course from the pre-entered racing marks. Simply download the GPX file to your MicroSD card and import the waypoints into your MFD using the file import tool. With our RaceRouting™ - Quick Race Course Builder, you can then build a race route quickly and easily by entering the mark ID’s in sequence. Each mark is described by a code containing just two characters – a single digit and a single letter, or two digits. 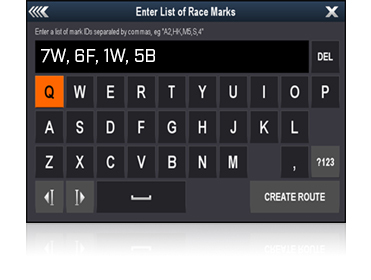 Enter the sequence of race mark IDs into your multifunction display separated by commas. The route is then built automatically and is displayed directly onto the chart. This provides racers with a huge advantage as race committees may modify a race course for changing wind, weather, traffic or other conditions at short notice. Raymarine Advanced Sailing Tools come standard in LightHouse II Release 14 or higher, and with RaceRouting™, Smart Mark and Smart Start being just some of the new tools for sail racers, you’re bound to get ahead this season with Raymarine onboard. LightHouse II R14 brought a number of additional sail-specific tools and features that are compatible with all current Raymarine MFDs and Instrument Systems. Simply update your Raymarine LightHouse II compatible MFD to the latest version today to begin enjoying all of the latest features. Note: These features are only visible when one of the ‘Sail’ vessel types is selected during the MFD setup. For help and to find out more about R14 click here. Please complete the short form to download the 2016 Solent Race Marks.